What I realized tonight is we have a great idea for a book. The working title is THE DEEP SOUTH BEACH BARS OF '66. I got so much stuff on The Vapors in Biloxi tonight you won't believe. It'll be a book about all the 1966 beach bars with LIVE MUSIC from Biloxi around to Miami & Daytona & up to Jacksonville. I finally found my HISTORICAL ATLAS OF ALABAMA. I'm thinking about driving over to White Hall this weekend & exploring where the northern boundary of Lowndes County meets the Alabama River. The State of Alabama maintains the battle site of HOLY GROUND. THE AMERICANS LOST only one man, the unfortunate ensign James Luckett, one of the signers of the petition asking Claiborne not to attack the Holy Ground. The Red Stick losses were, according to the Americans, thirty-three, including one of Tecumseh's Shawnee prophets and twelve African Americans. This encounter is reportedly the only battle of the Creek War in which escaped or freed African American slaves fought with the Red Sticks against their American foes. A great song...I'm teary eyed right now. You will seldom hear the words leave my lips, "Well, he's a pretty good guy for a Yankee." appear to be a great group & I ain't even gonna mention the Yankee. I'd try to give 'em push. They got a gig in Mobile tonight. get the word around so we can try to give these cats a push. I listen to their stuff all the time while I'm blogging. & you BE rockin' and rollin'! playing tonight at BLUES TAVERN at Government Boulevard in MOBILE, ALABANANA!!!! We are very excited to announce that we are an official selection for the Sidewalk Film Festival in Birmingham, AL and the Prince Edward Island Film Fest in Canada. Screening dates will be on the website as soon as the festivals assign us a date and time. > and login as a fan of skiptracers and add it to your calendar. This goes a long way with creating a buzz about the film for the festival runners. Thanks for all of your help and support with this project. I want to tell all of you that my long awaited project is almost complete. The release of my book is just around the corner. Wanted to let you know that I didn't get any nasty emails today. & let you know that receiving your phone call today was the peak experience of my Tuesday so far. As you could tell, when I received your call, I was slap dab in the middle of cluster f*ck on Hickory Street over in Kaulton. Nobody knew at the time that a bad wire in the wall going to a plug in the hallway had shorted out both hallway lights, the kitchen light, the dining room light, the carport light and the utility room light. There was also some other stuff going on. I'm not griping. I love being the field marshall and making so much happen that when you walk into the office at 5:30, the boss doesn't have the gumption to ask, "Well, what'd ya get done today?" You remember about what I told you about the long distance phone call I had this morning. It brought me down like ton of lead. So, hearing your words of encouragement helped me get my second wind. I told you this a long time ago, "If this thing continues, you're gonna see some fireworks!" It looks a whole lot better now. It's been sodded and watered a lot. There's a potted plant and a vase filled with fresh flowers. No headstone yet. It's shaded all day long by a beautiful live oak. NO BETTER MEMORIAL FOR A DRUID FROM TUSKALOOSA!!!! Let me know if you want some acorns. Like Mama always said,"Bob, a stuck pig hollers the LOUDEST!!!!" Guess that goes to show, some things just never change. >My poetry, puerile as some of it was, proved prophetic. BTW, Wilbur's CD is awesome! I could hardly listen to anything else for 2 weeks after I got it. I'm still haunted by the spare beauty of "Johnny." My Only Photo At The Reunion & LOOK WHAT I'M TRYING TO PUSH! & The SORRY Bastards Wouldn't Even Mention It Once! country, such as George Jones, Conway Twitty, etc. still living in Dothan I get back there often. I would really like to hear from you, e-mail me if you have time. 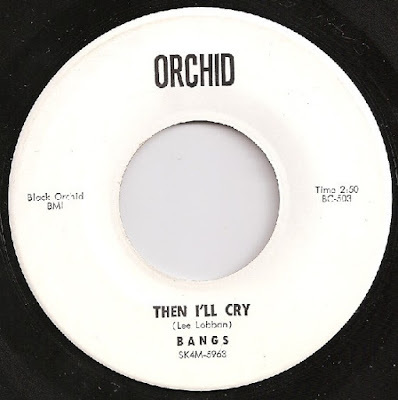 This is the story of THE BANGS, as told by keyboard player Lee Lobban (later of the Dead End Kids). Cary, Jim and Terry grew up in Marianna Florida and George was from Port St. Joe. 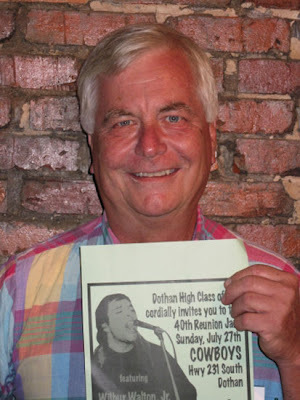 The group played mostly college frat parties and I joined them in October 64 after hearing them at an FSU frat hop. I was the youngest member (18) but adding keyboards to the band got calls coming in from nightclubs and other venues. 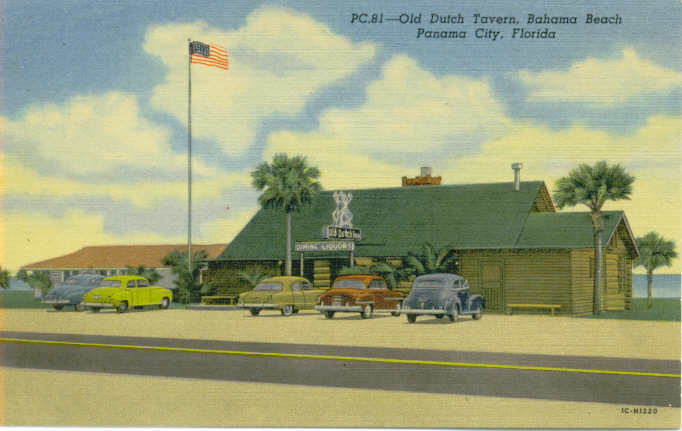 Our first extended club gig was at the Old Dutch Inn in Panama City in May 65. Panama City was the Miami Beach of the north Florida gulf coast and this particular beach club was the most famous. They featured acts like the Swingin Medallions (Double Shot of my Babys Love), Bobby Goldsboro, the Webs, James Gang, Classics 4 and Candymen. We followed the James Gang into the club and after our first night there, their manager (Buddy Buie) wanted to sign us. We already had a commitment with another manager in Miami who had bookings for us beginning in July. 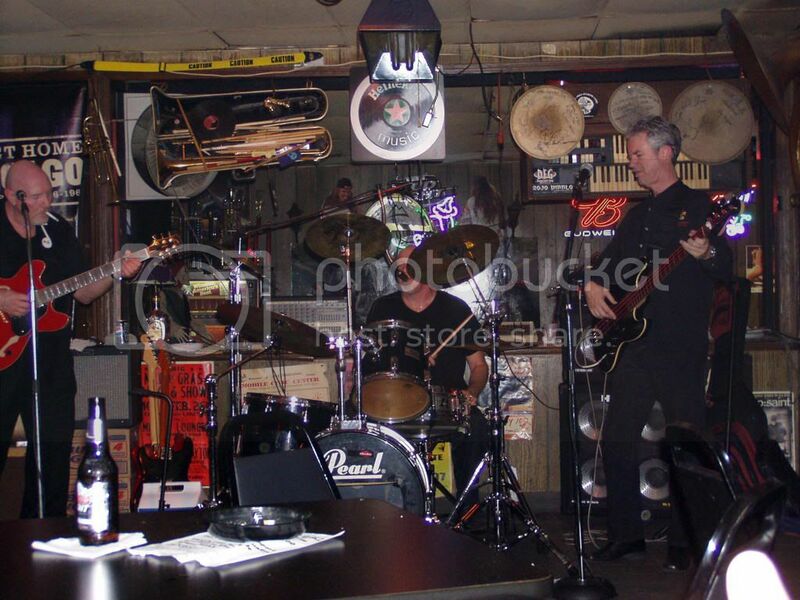 Before leaving for Miami we had one more gig at a beach club in Fort Walton Beach. Now here's a good story - after playing the gig, we asked the bartender if there were any clubs still open where we could catch some of the local entertainment. He directed us down the street to the Holiday Inn where a good soul group was performing. That's where we met Wayne Cochran for the first time. We sat down and waited for his last set. There was no one else in the club yet he and his 10-piece band performed for us for 45 minutes non stop. After it was over, he sat down with us for a drink. We told him we were going to Miami and he asked if there were any show clubs down there that would accommodate his act. I told him about a place called the Peppermint Lounge. He told us if he could land a gig there, he might finally be able to fix his teeth. Well, I guess it all worked out cause when I ran into him again about a year later, he had a new set of teeth. We hit Miami at the end of June 65 expecting to go right into the Par Tee. Owner Stew Kaufman didn't want to make a commitment to hire us until he heard us. Plus, the musicians union, which had clout in those days, imposed a 10 day moratorium on us before we could be allowed into any clubs. So in the meantime, we performed several gigs. 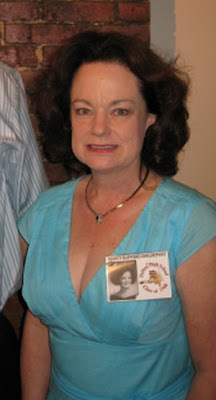 One notable was at a dance club (can't remember name) in Hialeah where we were on the same bill as the Shaggs. We opened up with our best tunes and all I remember is that everyone was dumbfounded because they had never heard an act like ours, especially with so many unknown songs from North Florida. The Shaggs were also jaw-dropped and as Cleve told me years later, they were so nervous about going on after us that they got into a fight over which songs to play. Anyway, Stew hired us on an open-ended contract and we started at the Par Tee Lounge as the guest band next to the Blue Beatles. Word quickly spread and lines began wrapping around the building each night. Stew was a great one for advertising and WQAM was blasting our name on the air every half hour - billing us as a must-see super rock band from North Florida. He had a spending war going on with the owner of Trader Johns as there were equally as many commercials touting the Birdwatchers. It was such an exciting time to be in the music scene in South Florida. I remember one night Stew mentioned that there was a rumor flying that the Rolling Stones were in Miami and might show up at the club. I remember going on stage for our last set of the night and one of my band members whispered in my ear that three of the Stones and their manager were sitting along the back wall. I couldn't see anything due to the stage lights and never got to meet them because they left suddenly after a bar patron discovered them. At the end of the summer, two of our players wanted to return to FSU to continue with their schooling. We had no choice but to give our notice and although Stew was disappointed, he got a commitment out of us to return for two more weeks at Christmas. In the meantime, we continued playing frat parties and got a chance to record a 45 with 2 songs called "Then I'll Cry" and "2120 South Michigan Avenue". After our Christmas gig at the Par Tee, we never played again. Cary and Terry got drafted in January 66, which broke us up and I returned to Miami to join the Blue Beatles. One last gift we left Stew was the telephone number for Buddy Buie. He used it to make his connection with all the Alabama and Georgia groups that followed. You know the rest. As for the band, I lost contact with them and never heard from any of them again. I'd love nothing more than to reconnect. AIN'T NO DOUBT ABOUT IT! YOU'RE CUTER THAN A SPECKLEDEE PUP UNDER A COLLARD LEAF!